- 10 segment LED bar graph display necessary to indicate the level of titration and useful for analyzing the solids, liquids and gases. Karl Fischer Moisture Titrator is highly in demand among the clients for its superior performance. Our range of Karl Fischer Moisture Titrator is tested on various parameters by our experts in order to provide the clients with the best. Display: 8 digit bright red seven segment display. The Routine Titrator The Routine Karl Fischer Coulometer combines fast and precise water content determination with very simple operation. Samples from any industry with water content between 1 ppm and 5% are analyzed in single measurements or as sample series with statistics. 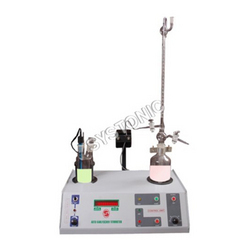 We are involved in providing Karl Fischer Titrator that meets on customer’s demand. Furthermore, the product is stringently tested on well-defined parameters to ensure its performance. - Resolution: Amber color reservoir, 250 ml for longer stability. Facility to transfer reagent from burette back to reservoir. 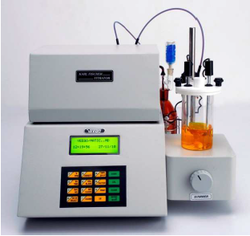 With the help of our expert team members, we have been able to provide Karl Fischer Titrator.